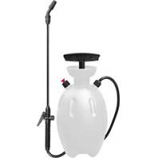 Suitable for plant protection chemicals cleaning solutions and many other uses.. Maintain fertilizers and eliminate herbicide and insecticides. Easy grip shut off. Built in funnel top for easy fill. .
• Stainless Filter Screen, Plastic Adjustable and Flat Fan Nozzle.